I met a friend for happy hour at a German Biergarten located about 30 minutes from my house, I adore the picnic table seating, soccer on all of the TVs, friendly bartenders, and their surprising [as it is a beer pub] petite but interesting selection of German and Austrian wines. 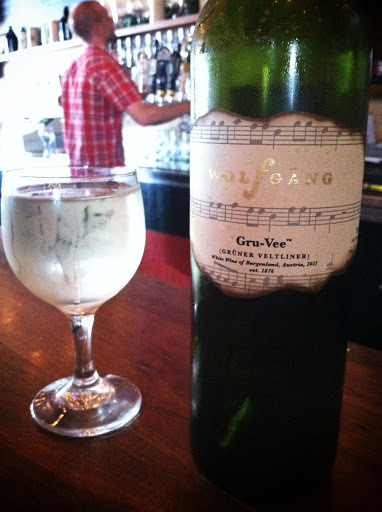 As I have not been picking up many Grüner Veltliner bottles yet this summer, I selected Wolfgang ‘Gru-Vee’ Grüner Veltliner 2011 from their white wine list [which consisted of a Gewürtraminer, 2 Rieslings and the Grüner Veltliner]. I was not able to find any specific vineyard or winemaker details other than Wolfgang Vineyards is a family estate located in the Burgenland region in Eastern Austria along the Hungarian border, and the family has been growing grapes there for many years. Over the past 15 years huge strides have been made in the quality of Burgenland wines in general. The majority of the vineyards are still family owned, vineyard methods have improved, such as utilizing organic and biodynamic methods, new wineries have been built, and the indigenous grapes have been reintroduced. Pale straw in colour, aromas of candied ginger and red apple rose from the glass. Tangy apple and lemon flavours comprised the light body, whilst subtle grapefruit notes enlivened the dry, crisp finish. Although a bit too angular and tart for my personal preference, this is a simple, easy drinking glass good with a light dishes.